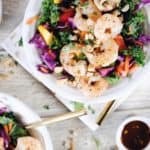 Salads just sound so good in the summer! I love that they are light, yet still filling, and then there are the toppings – that’s the best part! 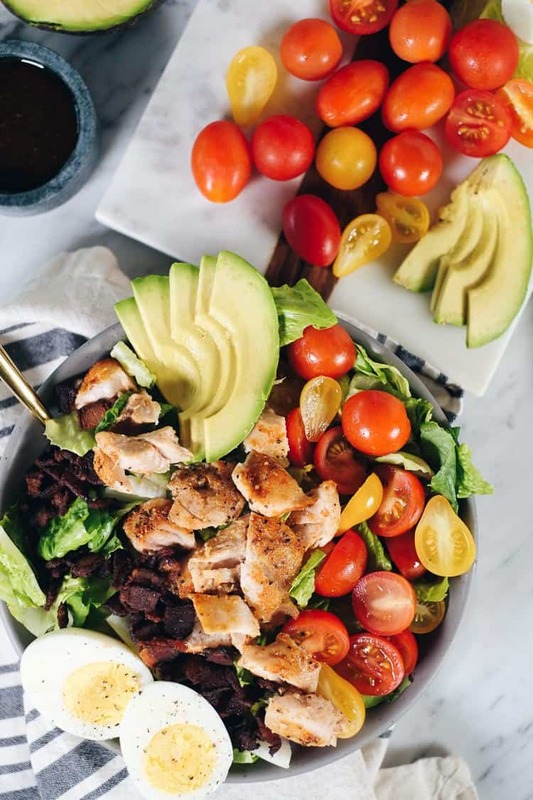 This easy Paleo cobb salad is packed with all the flavors, like smoky bacon, creamy avocado, fresh tomatoes and a tangy balsamic dressing! I think the toppings are really my favorite part about making salads. 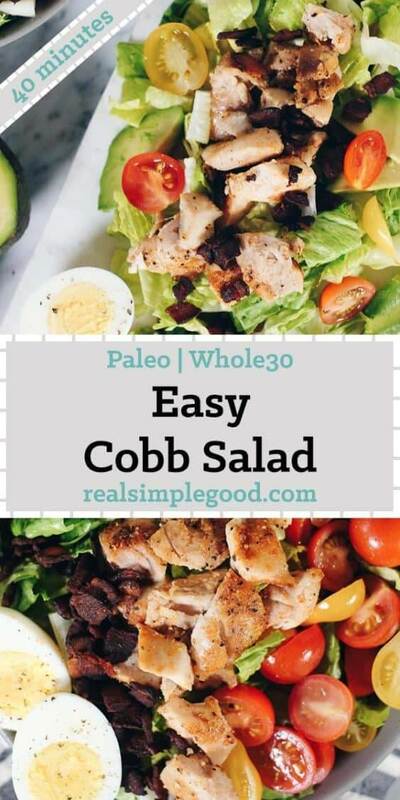 This easy Paleo cobb salad has some of my favorites! I love the combination of chicken, bacon and avocado. Add some cherry tomatoes fresh from the garden or farmer’s market, and I’m pretty much in heaven! Plus, add some hard or soft boiled eggs, and I’m all in! 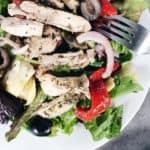 What are some your favorite salad toppings? 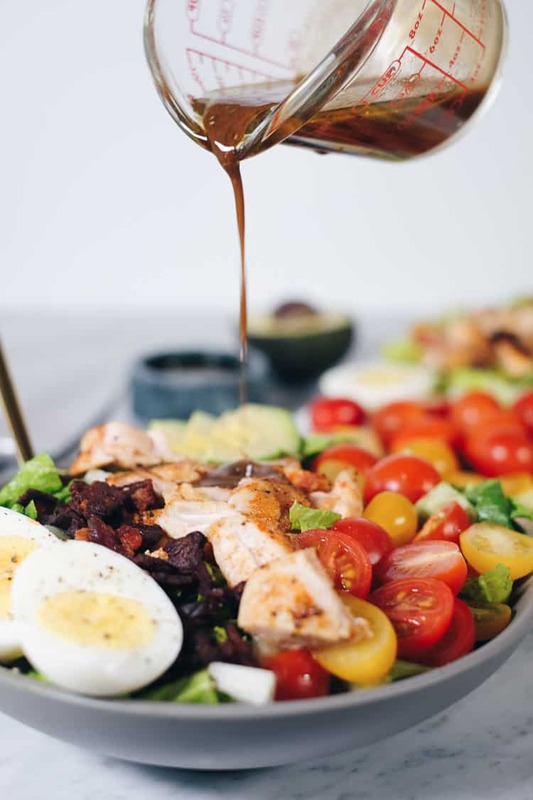 I know cobb salads tend to have a creamy dressing, but we’ve veered a little here because Justin makes a seriously tasty balsamic dressing, so we went with that for this one. It adds a little punch to go with the creamy avocado and smoky bacon. Plus, I always love balsamic paired with chicken and tomatoes, so give it a try and let us know what you think! We seasoned the chicken simply, using garlic powder, paprika, salt and pepper. 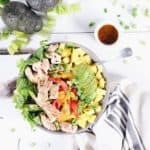 It’s a basic combo, but one that tastes great with the rest of the flavors in this easy Paleo cobb salad. 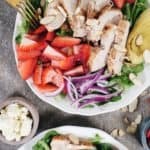 You can use either chicken breast tenders or chicken thighs for this recipe as both cook up pretty quickly broiled in the oven. 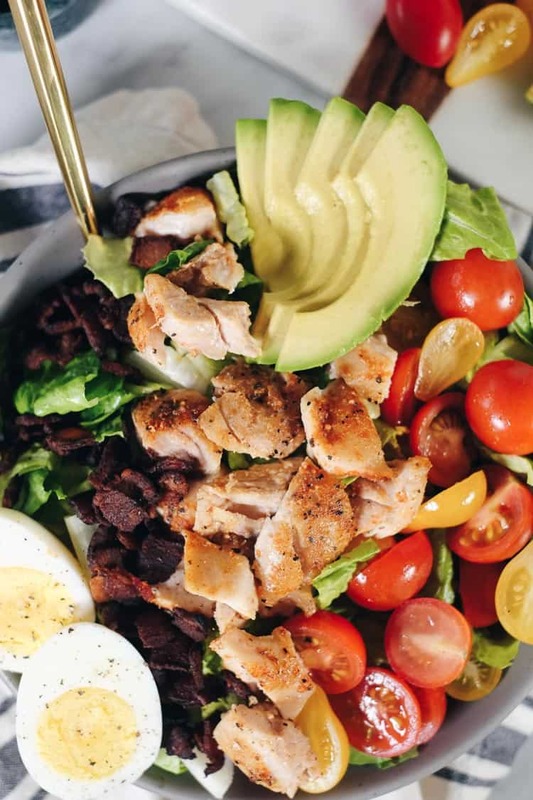 If this easy Paleo cobb salad has you drooling, be sure to check out some of our other yummy salads too! 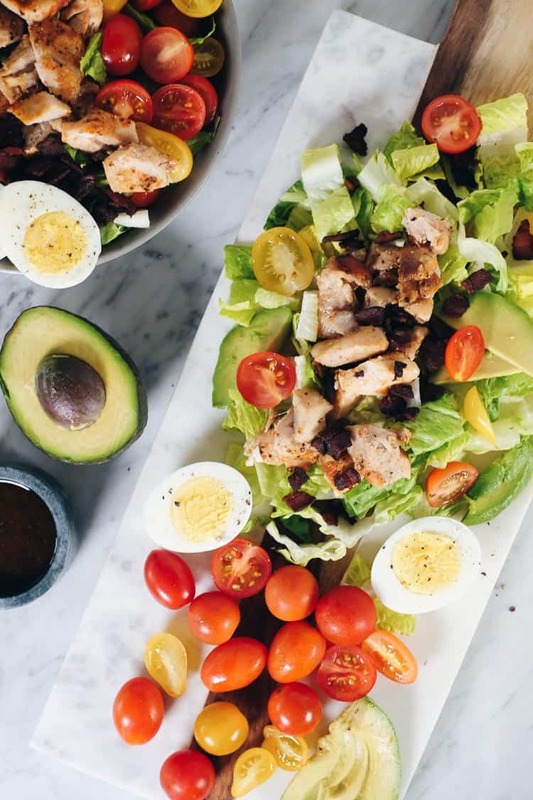 Go ahead and make this easy Paleo cobb salad for a light, yet filling meal. Then, make it again! 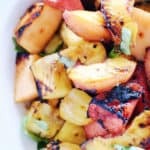 It’s the perfect meal to enjoy all summer long! Let us know how it goes by leaving a comment below. Also, take a photo and tag us on Instagram @realsimplegood, so we can check it out! 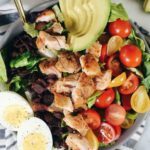 This easy Paleo cobb salad is packed with all the flavors, like smoky bacon, creamy avocado, fresh tomatoes and a tangy balsamic dressing! Place eggs in a single layer at the bottom of a pot. Cover with at least an inch or two of cold water. Heat the pot on high heat and bring the water to a full rolling boil. Turn off the heat, keep the pan on the hot burner, cover, and let sit for 12 minutes. Run eggs under cold water to cool. Peel eggs, cut each egg in half and set aside. Dice bacon and place a large skillet over medium. Once hot, add bacon to cook. Cook, stirring occasionally, until bacon is getting browned and crispy. Remove and place on a paper towel lined plate. Turn oven on broil and grease a baking sheet with oil. Place chicken on baking sheet and mix seasonings together in a small bowl. Season both sides of the chicken with seasoning mix. Place in the oven to broil for 6 minutes. Remove from oven and flip chicken over and return to oven to broil for another 6 minutes, or until chicken is cooked through. Remove from oven and set aside. Combine all dressing ingredients in a small jar and cover with an air-tight lid. Shake the jar or use a whisk to mix all ingredients well. Mix again just before serving. Cut up lettuce, tomatoes and avocadoes. Cut chicken into bite sized pieces. To serve, arrange all of the toppings into rows over the romaine lettuce. 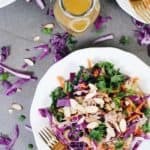 Drizzle the dressing over the salad and serve. Sharing on my W30 page!